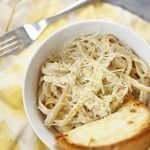 This creamy Instant Pot Chicken Alfredo is delicious and so simple. You’ll have a meal ready for your family in no time! Add oil to the pot and turn on “Saute”. When the oil is hot, cook the chicken in the pressure cooker until golden brown on the outside. Once the chicken is brown, add all other ingredients to the pot. Turn on high pressure for 5 minutes and quick release when finished. Enjoy with more shredded parmesan, garlic bread and/or salad! *If using spaghetti or alfredo or any other long noodle, break the pasta into smaller pieces.